The only WordPress maintenance & support service built exclusively for Kinsta clients. Being the big dog, WordPress is always under attack. So, we entrust maintenance and security to Chuck Norris. Well, pretty much. Sometimes stuff just happens. When it does, you need people. Together with Kinsta, that’s who we are. Even while you sleep, we’ve got you covered. We back up everything every day. So, relax and leave the worry to us. No more “site down” errors for should’ve-been clients. We monitor 24/7, so we’re on top of issues the moment they arise. About half of your visitors leave if your site takes longer than 3 seconds to load. With us, no patience is required. From around-the-clock hosting support to whatever-you-need consulting, Kinsta + SkyrocketWP have you covered. SkyrocketWP is a must for everyone who is serious about taking their business to the next level. SkyrocketWP jumped the number of people visiting our website and our sales have increased. This has been a great experience! It’s almost impossible to find a company with this type of customer service. Highly recommended! Choose your rocket. After checkout, we’ll grab your Kinsta and WordPress login info to get you setup, protected, and supported. You’ll be updated throughout the 48-72 hour setup process. After that, you’ll get monthly update, upgrade, and performance reports. With stellar WordPress maintenance, hosting, and support in action, you can (finally) talk about your new best friends. From image compression & HTML improvements to CDN & advanced caching, we’ll keep you moving fast. Stellar user experience requires fast load times, so we don’t just make your site fast. We keep it that way. In the world of on-demand, website downtime isn’t an option, so we monitor your uptime in real time. Your Google Analytics, crawl stats, rankings, Adwords, and Facebook Ads. All in one beautiful interface. We know we’re doing what we say we’re doing. And so will you, thanks to our monthly reporting. Wait, I have more questions. money-back, page load speed guarantee. packed with speed, leads & security. starting price for the kitchen sink. ** Not yet hosting with Kinsta? Click here. DO I REALLY NEED A WORDPRESS MAINTENANCE SERVICE? (1) Time is money (yours and your clients’). Who has the time to make sure WordPress, your theme and all your plugins, stay up to date? Not too many. Letting this slide can cause downtime. What’s worse is you will lose valuable visitors and customers – not to mention creating a dysfunctional site. (2) Hacking happens (and it can be catastrophic when it does). WordPress is the largest (and best) website content management system in the world. .
(3) Your (should-be) clients demand speed. No one waits on a slow site. Not us. Not you. Not your clients. In fact, half of your should-be clients will be frustrated after just 2 seconds and they’ll abandon it altogether after 3. So, one second can be the difference between earning a client and (functionally) funneling them to your competitors. Don’t be that business! (4) Downtime reflects upon more than just your website. Finding your site live isn’t an added bonus for your clients. It’s an expectation. And a frustrating experience with your website is a frustrating experience with your company. A live, healthy website reflects a live, healthy company. If you want fruit from your digital garden you gotta take care of it. Kinsta quite literally has one of the best support teams in the world (we contact them regularly). If you need hosting support, we certainly recommend them. That said, a benefit of SkyrocketWP is that you can call us and we will work with Kinsta on your behalf to resolve any issues that may arise. To this point, we haven’t stumbled across an issue that we’ve been unable to resolve. Though we plan to offer 24/7 support, we’re not there yet, so contact SkyrocketWP during business hours (8:30am-5pm CST, Mon-Fri) and Kinsta for after-hours emergency help. We just don’t get many tech support calls. In fact, we currently average about 1 legitimate tech support request per quarter… from our 100+ clients combined. Why? Because, in general, stuff just works. That’s (part of) the beauty of the SkyrocketWP & Kinsta tandem. So, you get the comfort of knowing you have people and the comfort of knowing you’ll likely never need to contact them. DOES SIGNING UP LOCK ME INTO A CONTRACT? No. You are free to discontinue our WordPress maintenance services at any time, although we have no idea why anyone would want to do that. Seriously. HOW CAN I UPGRADE MY PLAN? You can login to your account at any time to upgrade or downgrade your plan. Upgrades produce in our office Super Bowl-style cheering, you-just-turned-5-years-old-style confetti, and MC Hammer-style dance moves. You are free to use PayPal, Apple Pay, credit or debit card. WHAT DO YOU DO IF MY SITE IS HACKED? Kick the hack to the curb and fix it asap! Simple. We get it back up and running. We’re here so you don’t have to worry. WHAT HAPPENS IF ONE OF MY THEMES OR PLUGINS IS NO LONGER SUPPORTED? While we cannot replace your theme and plugin developers, we will continue monitoring your themes and plugins for issues. DO YOU SUPPORT WORDPRESS MULTISITE? Yes we do and we are happy to say we do it well. 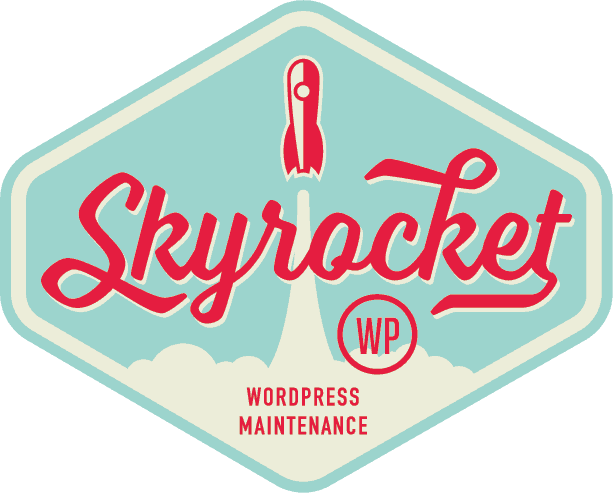 SkyrocketWP is the WordPress maintenance service of SEO Skyrocket, a fun group of digital marketers who love developing WordPress sites. No, thanks. I love worrying about my website.